4 bedroom, 3 bathrooms, and a 3rd story Tower Room. Two Community Pools. K, 2 Queen, 2 twin beds. Pet friendly. Located in Old Florida Village just off Scenic Hwy 30-A. 1st floor: Kitchen, Living, Dining, Full bath; Queen Bedroom. "Abbotsford" is a very special cottage in Old Florida Village! Just a short walk to the beach, located in the center of the neighborhood; Furnished with designer furniture, this Florida cottage is nothing short of luxurious comfort and class with a touch of beachy coziness. Also, one of the neighborhood's two pools is located only a few steps away! The downstairs has porcelain tile laid on the diagonal while the upstairs has upgraded Brazilian Cherry hardwood floors. 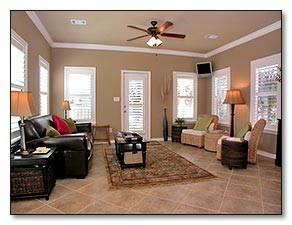 There is crown molding throughout, custom painted cabinetry, plantation shutters and all the plumbing and lighting fixtures have been upgraded including numerous recessed lights for a true luxury feel. A wonderful vacation cottage, decorated professionally in a warm, inviting style with a combination of dark woods, leather and sea grass, luxurious comfort and class with a touch of beachy coziness, with many more upgrades and special touches not normally found in a rental property. Abbotsford is one of 75 Florida cottage-style homes nestled in Old Florida Village - Scenic Highway 30-A. 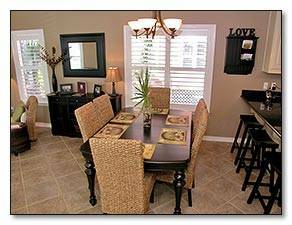 Abbotsford is centrally located in the neighborhood, just a few steps to one of the 2 community pools. 1st FLOOR: Open floor plan – Spacious Living Room, Dining Room and Gourmet Kitchen with stainless appliances, ceramic stove cook top; granite countertops, drop lights, bar stools. 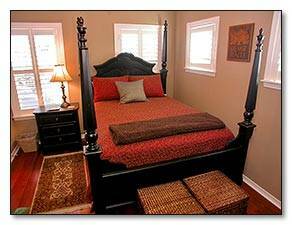 A guest bedroom with Queen Bed is also conveniently located on the main level along with an adjacent full bath. 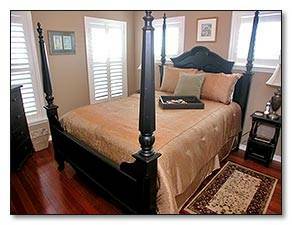 2nd FLOOR: The Master Bedroom features a King Bed, private bath with oversized tile shower and private porch. Just down the hall are 2 more guest rooms: one with a Queen Bed and the other with 2 twin beds and adjacent full bath. There are two hot water heaters so you don’t have to worry about cold showers and the water pressure is strong enough for showers to used simultaneously! 3rd FLOOR TOWER ROOM: Overlooking ‘Hidden Lake’, this room features comfortable leather chairs; ottomans; a loveseat and LCD TV with DVD and VCR. The tower is great as a media room or a quiet retreat to enjoy a good book. Special Features: High Speed Wireless Internet - Unlimited Nationwide Long Distance - Premium Cable - Premium Mattresses (all bedrooms) - Premium Location Within the Neighborhood. 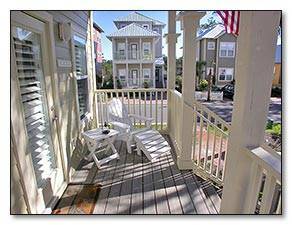 THE NEIGHBORHOOD AND SURROUNDING AREAS: Old Florida Village is a 75 cottage community with two pools (one of which is just one cottage from Abbotsford), white picket fencing, natural landscaping, brick paved streets and meandering walking paths. It is located on Scenic Hwy 30-A in Santa Rosa Beach between Gulf Place Town Center/Amphitheatre and Goatfeathers Restaurant. Old Florida Village was designed similarly as the Seaside community which is where The Truman Show with Jim Carey was filmed. Grayton, Watercolor, Seaside, Seagrove Beaches are just 10 minutes to the east and Alys, Seacrest Beach and Rosemary Beach is another ten minutes past Seaside. There is only one road into the neighborhood which creates a nice private feeling for adults & children. Take a stroll or bike ride around. Convenient bike rentals are available in the area. Traveling west from Old Florida Village, Sandestin's Baytowne Wharf and Silver Sands Factory Stores (the nation's largest designer outlet mall) are only a ten minute drive and the new Destin Commons Mall and Movie Theater is another five minutes past Silver Sands.&#8232;&#8232;The Destin Harbor is approximately thirty minutes from Old Florida Village. In addition to these attractions, there are many golf courses, outdoor music venues, biking and walking trails, and many other activities the whole family can enjoy! Abbotsford is located on one of only 8 premium lots in the center 'island' section of the neighborhood - the pool is just steps from the front door. 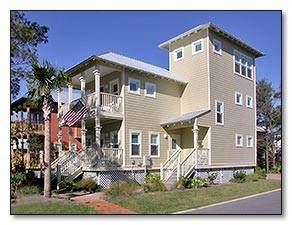 4 bedrooms, 3 baths, Tower Room ~ sleeps 8. Relax on the Front Porch in genuine LL Bean Adirondack Chairs! Open & inviting spacious floor plan. Decorated in a warm, inviting style with a combination of leathers, woods and sea grass. Accented with signature pieces from Pottery Barn & Ballard Designs. Dining Table seats 6 comfortably w/ extra seating at the bar. 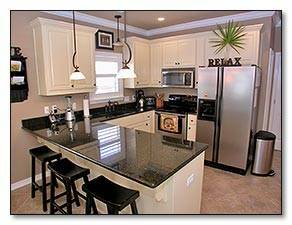 Gourmet Kitchen, Stainless Appliances, Granite Countertop, Kitchen, Microwave, Dishwasher, Side-by-side Refrigerator with Ice and Water in the door, Venetian Bronze Fixtures by Delta. 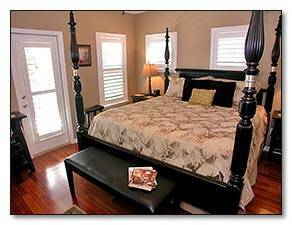 Master bedroom w/ King Bed, Premium Mattress, Private Bath & Private Porch! 1st Floor Guest Room w/ Queen Bed & Premium Mattress. 2nd Floor Guest Room w/ Queen Bed & Premium Mattress!